If you've never played Monster Hunter, then Monster Hunter 4 Ultimate is the best jumping-on point – but it's still hella confusing to the uninitiated. There are so many menus and icons and confusing screens of help text, and there's quite a lot to do before you can just grab a weapon and kill something with it. Naturally, you'll get a feel for all of it as you go on, and the game does a better job than any of its predecessors at easing you in, but ideally you need a friend to give you some help. Monster Hunter has a bad habit of flooding you with information in the early stages and a lot of it will be totally foreign. If you don't understand all the baffling info that the game secretes in its not-always-so-helpful help text, don't worry too much. At the beginning, you don't really need to think about anything except getting a feel for one or two of the weapons, and learning the basic principles of quests. Most other things can wait. Here is all you really need to know: you attack with X, A and R in various combinations that you can try out for yourself, you use items with Y, you pick up quests from the Quest Counter, and multiplayer quests live in a totally separate building called the Guild Hall that you don't need to visit unless you're with friends. The first thing you'll want to do is wander around the village you've arrived in and get a feel for who everyone is. Then, you want to start thinking about hunting. The only thing that matters in Monster Hunter is what equipment you have. Want to be a gunner? Put on gunner armour and you're sorted. Fancy switching from tank to support? No problem, just craft a new weapon. So there is no chance that you'll pick a class you don't like, or level up the wrong way, or any of those other RPG pitfalls. It's very flexible. Monster Hunter 4 Ultimate has 14 weapon classes and not all of them are suitable for beginners (or for solo hunters). At the very start of the game, you will have one of each in your red equipment box in your little home. Later, you can upgrade them or forge better ones from the monster-parts and ores that you collect out in the field. Here's a rundown: good beginner weapons are green, ones you should avoid are red. Remember, you can switch between them at any time; there are no levels or stats determining what weapon you can use. Great Sword - big, slow, does good damage, but requires you to know the timing of monster attacks and get out of the way. Long Sword - a friendlier version of the greatsword that attacks faster. You can't guard with it, but you can move and dodge well with it unsheathed. It's a good option for starters. Sword and Shield - not enormously powerful, and there are some technical things to learn, but nonetheless a good beginner option - and you can guard with it. You can use items like potions whilst guarding, too, which is handy. Dual Blades - a more complicated version of the Sword and Shield. Maybe save it for later. Hammer - an advanced weapon; people use it up-close to attack dragons' heads and make them dizzy. Bit too slow for beginners, I think. You're likely to just get hit over and over. Hunting Horn - like the hammer, except you can play tunes on it. An amazing weapon, but most useful when you're hunting in a group and can play songs for group buffs (like a raise in attack power, or healing). Learning how songs work is also complex. Lance - one for the hunter who prefers to hide behind a big shield and poke things. Slow, but defensive. Gunlance - like a lance, but it can shoot shells from its tip. Only works up-close. It's also got a super-powerful charge attack. I adore this weapon. Switch Axe - a very cool and versatile weapon that transforms between axe and sword, but you need to spend time learning the combos. Charge Blade - kind of like the Switch Axe, this is a sword and shield that transforms into a giant blade. You can also charge it up. Insect Glaive - a new weapon class that involves twirling the stick around and vaulting over or onto monsters. A really fun weapon; the insect aspect of things is more complicated, but you can ignore that at the start. Light Bowgun - mostly a support weapon. Fighting with the bowgun isn't terribly exciting, but it can be effective if a monster keeps ruining you up close (I'm looking at you, Diablos). Buying ammo is bewildering at first; different bullets do different types of damage. You also need a whole separate type of armour to be a gunner. Definitely avoid at first. Heavy Bowgun - a bowgun that you set up like an artillery station, so you can't move well whilst using it. Has all the problems that the light bowgun has: you need ammo and different armour. Bow - a more exciting and slightly less fiddly ranged weapon that's more tactical than the bowguns. Best suited to experienced players. Once you've found a weapon you like, experiment with combos – maybe watch a video explaining them – and take it on a hunt. It'll probably last you quite a while, but sooner or later you are likely to come up against a different kind of monster that requires different tactics from you. It's harder to kill, say, a Lagombi with a Lance or Gunlance because they run around all the time, and when you eventually lumber up to them they're already off in another direction. So, have a backup weapon. Some hunters get through the whole game maining one thing and occasionally dipping into others. Some play with three or four different weapons. Some do even more, though getting enough materials to craft a whole raft of good weapons requires a lot of grinding. Monster Hunter feels like a different game depending which weapon you pick, so limiting yourself to one is cutting yourself off from a lot of potential fun. Quests come in three flavours: gathering, big hunts, and small hunts. This is pretty self-evident; a quest that asks you to go find some herbs is unlikely to require a really big sword. But be aware that you need different things depending on what quest you choose. For gathering quests, you'll want a nearly empty inventory to make room for all your junk, plus stuff like bug nets and pickaxes for gathering. Small hunts, where you have to kill maybe eight wee monsters, are a good opportunity to practise with an unfamiliar weapon. On big hunts, which challenge you to either kill or capture a monster, you want to bring a lot of supporting items and your A game. Look at what the quest is before you prepare for it. You start every quest at a campsite, where you'll see a blue supply box - this will contain emergency items like first aid meds, whetstones to sharpen your weapon and rations to restore your stamina, but you can't rely on them. Potions restore your health. You need them. You'll be given a few early on, and after a few quests you can buy them from the shopkeep or make them from Herbs and Blue Mushrooms (more on that later). Mega Potions are even better. You get those by combining a Potion with honey. Whetstones sharpen your weapon. If you use any blade, you need them, otherwise your weapon will get less powerful the more you use it. There's a little blade icon in the top right of the screen; if it's green, you're sharp, if it's yellow, you're fine, if it's red, you're screwed. Bug nets... catch bugs. If you see little butterflies fluttering around, run up to them and press A to gather them. You can use bugs for all sorts of things, from making shock traps with Thunderbugs to using Gluegloppers to craft. Pickaxes let you extract ore from mining points, which you'll need for crafting. You will need LOTS of ore. Gather it whenever you see an opportunity. Paintballs, when thrown at a monster, mark where it is on the map so you can follow or avoid it. Very helpful. Steaks restore your stamina (the yellow bar under your health bar), which degrades with time and fighting. Stamina lets you run, dodge and block. You do not want to be stuck fighting a Rathalos with a teensy little stamina bar. You can cook these on a spit, from Raw Meat, in batches. For gathering quests, you want to be running light, so that's all you'll need. You're unlikely to need much more for small hunts either. To kill a big bad monster, though, you're going to need extra things. Some suggestions: traps, Antidotes if it's poisonous, Demondrug or any other status-boosting item, Bombs if you want to get fancy. To capture a monster on a capture quest, you have to lay down a trap (a shock trap or a pitfall trap) and then hit the monster with two tranquiliser bombs. Usually there will be some bombs and a trap in the supply box, but always bring extra in case you miss with your first throw. See that little cat-chef dude in the village? He'll cook for you! This is tremendously helpful: after a good meal, you get a few random special skills (defence boost, gathering speed boost, stuff like that), and your health and stamina bars will be extended. Pick things with the FRESH icon, and try to pick two different types of food (eg, meat and bread, fish and dairy). The stars next to the ingredients represent ingredient quality. You can do quests to raise it, later on. Always pay with cash. Ignore the voucher options. They mean nothing right now. Later in the game, when more of the hunting areas open up, you'll need slightly different kit depending on where you're going and what kind of monster you're hunting. Item sets let you save the items in your pouch as a template - so you can have an all-purpose item set for the usual hunts, a Hot Drink set for cold locations, a Cold Drink set for hot locations, an item set for poisonous monsters, etc. This saves you from starting a quest, then realising you've forgotten a crucial item. You can register item sets from any equipment box – the one beside the quest gate, or the one in your home. If it's not clear by now, you need a lot of items in Monster Hunter. You'll get through things like potions quickly. So, to save you from spending all of your hard-earned pennies on basics, you can combine things that you find out in the field to make them, instead. This is far less complicated than it might seem. Go to an item box (the one at the quest gate, or the one in your home) and select Combine/Manage Items. Now you can see all your different items in a huge grid, and try combining them. Once you select one item, all the other items that it can be combined with will be highlighted. It's an adventure! Some useful combinations: Blue Mushroom + Herb = Potion, Potion + Honey = Mega Potion; Tranquilliser + Bomb Casing = Tranq Bomb. You can also combine items out in the field, but that I never do. Once you've found a recipe, it's there forever in your Combo List as a shortcut. You know the little purple dude sitting on the cushion in town? Before long, you will be able to use him to multiply simple items. Simply give him something, pay for it with the quest points that you earn from hunting things, and come back after a few quests to find more of that thing. This saves you doing tedious gathering of essentials like Herbs and Blue Mushrooms. We're getting into more advanced stuff now. You'll notice, after your first few hunts, that you can craft various things out of the materials you've gathered or carved off monsters. You might be thinking, what's the point of a full set of the same armour, besides looking cool? Gems and Decorations, which you can forge later on, add or remove points from the skill tree. So you can de-activate a negative effect, or boost a nearly-active one over the threshold. Top tip: the Tetsucabara armour set gives you extra health, so that's a good one to go for early on. You get a bunch of rewards and monster materials every time you successfully hunt a creature, but there are ways to maximise this. Firstly, capturing yields more than killing. Secondly, you can "break" (wound) certain parts of a monster: the head, the crest, legs, claws, etc. If you break these monster bits off, you'll get extra materials at the end of a quest. You can also slice off most large monsters' tails with a big enough blade and some persistence - then you can carve it. Monster tails make great weapons. Annoyingly, though, you don't always actually get the tail part from that carve. Sometimes you just get a stupid scale. The Palicoes (cat-fighters) are brilliant. On your own, you can bring two Palicoes with you: your main cat, whom you customise at the beginning, and a sub-Palico with different skills. You can find wild Palicoes out in the field once you've gotten as far as Cheeko Sands in the single-player, and recruit them to your little team. They really help out in fights, whether by distracting a monster, laying traps or healing you. From the board in your home, you can assign Main and Sub Palicoes. The Sub Palicoes you choose will affect what skills your Main Palico can use. Once you've got a few new cats recruited, try swapping in several cats with the same skill (say, Support) into the Sub Palico menu and see what happens to your Main Palico's skills. 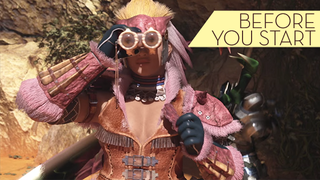 This is probably the most important Monster Hunter tip of all: find some friends. Climbing Monster Hunter's learning curve is so much more fun when you aren't alone. If none of your friends are hunters, you don't need to be alone: thanks to online play and wikis, there's much more help available. The dynamic of monster-hunting changes hugely with two or more people, and it's something everyone should experience. Happy hunting! If you've any more questions, leave them in the comments and I'll update these tips as we go.